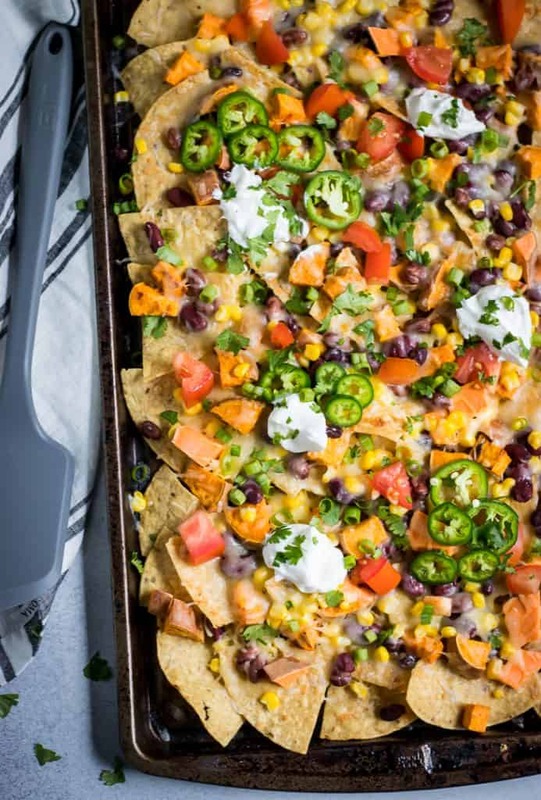 These simple game day Roasted Sweet Potato Sheet Pan Nachos are loaded with sweet potatoes, black beans, tomatoes, plenty of cheese, spices and so much more. A perfect way to snack while cheering on your favorite team! I am really not one for football, but I sure do love what pairs perfectly with it: food! Every Sunday starting early fall, I can almost guarantee there will be a pot of chili nice and warm in the crock pot. This has been a tradition for quite a few years in our house, and I have yet to hear any complaints. Anthony is happy with the football watching food and I am perfectly content with my own warm mug of chili while usually working on editing photos or something for the blog. (I’m sure the added bonus for Anthony is that this keeps me quiet so he can stay focused on the game. A lot of Sunday’s Anthony rock climbs in the afternoons and then gets home super hungry but when it’s still a bit early for dinner. And since he is ready to sit down and watch football, game watching snacks are a go. And most of the time he wants nachos. You won’t hear me complaining–unless he decides not to share, that is! I will admit I have been known to be super lazy and toss some cheese on chips and microwave them in my day, but that really is not gonna cut it anymore. Sheetpan nachos are pretty much ready in minutes and the cheese is sooooo much better when it isn’t melted in the microwave–no one wants their cheese to harden and then break into pieces–we want it to be gooey and soft! If we are dong nachos then we want them to be done right. I am not talking the plastic container of tortilla rounds and a side of yellow goo at the stadium. 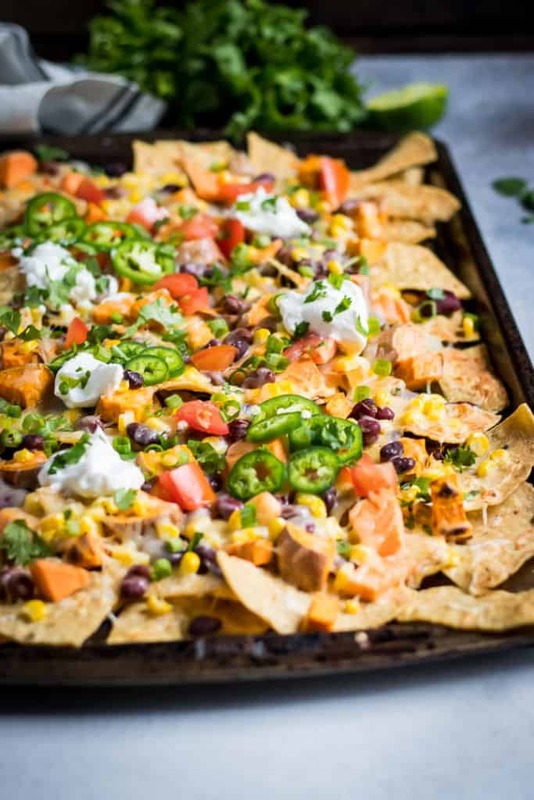 Let’s do nachos that are packed with all we can toss on them: beans, jalapeños, corn, tomatoes, cilantro, spices annnnd the big winner in these nachos: sweet potatoes! 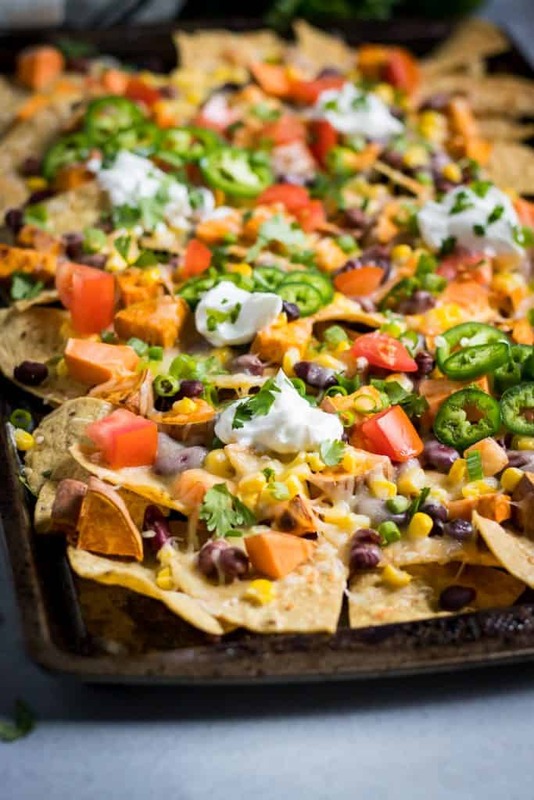 Roast up some sweet potatoes and add them to your nachos–game changer. I promise. 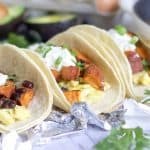 Yes, adding the sweet potatoes will tack on about 15 more minutes to making your nachos but you can triple up on the sweet potatoes and then have a bunch in the fridge prepped and ready for the week. Or maybe you already have some in the fridge so they don’t tag any time onto your effort. 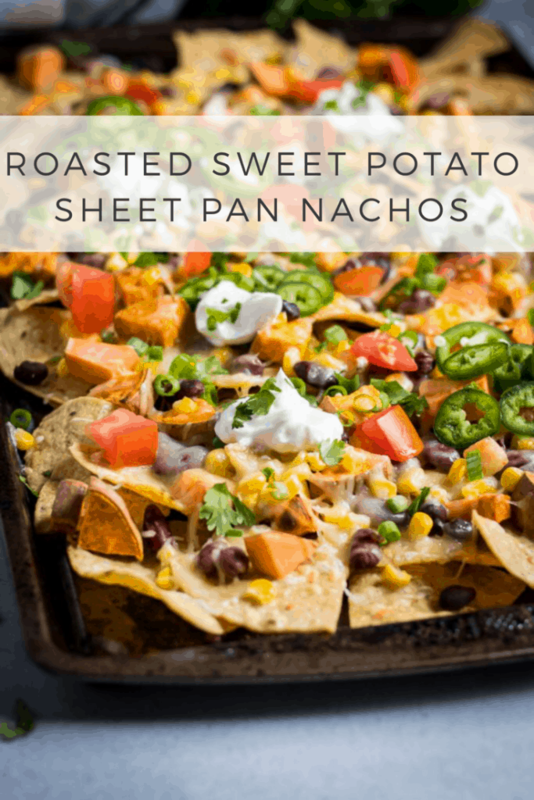 These Roasted Sweet Potato Sheet Pan Nachos can really be a meal if you’d like. We topped ours with some plain Greek yogurt, made them even more filling. Feel free to toss in some meat like shredded chicken or ground beef or turkey. They broil up super fast so once assembled, you will be eating bite after gooey bite in no time! Also, a little added bonus: this recipe is totally fun for the kiddos to help make! They may look a little less pretty but they will have so much fun! Preheat oven to 425°F. Rinse and cut sweet potatoes into small 1 inch cubes. Toss with olive oil and a dash of sea salt and lay evenly on parchment lined baking sheet. Bake for about 15 minutes, until soft and slightly golden. Remove sweet potatoes from oven and set aside. Line a sheet pan with tortilla chips trying to cover entirely. Layer sweet potatoes, tomatoes, corn, and beans onto chips. In a small bowl, toss cumin, chili powder and shredded cheese together and then sprinkle evenly over nachos. Switch oven setting to Broil on LOW. Place nachos in oven and broil for about 2-3 minutes or until cheese is melted. **It cooks fast so keep a close eye on the oven! Remove nachos and top with jalapeños, cilantro, chopped green onion, Greek yogurt and any other desired ingredients! Enjoy! Not only are these some of the prettiest/ most colorful nachos, but they’re some of the tastiest! 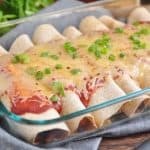 I’ve been trying to think about what I want to make for Game Day appetizers and this recipe is perfect – thanks so much! Yep, you can never go wrong with nachos! 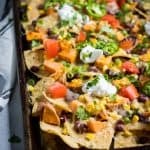 Adding sweet potatoes to these nachos is just what I needed! Made them on a Tuesday so it was fitting for taco Tuesday! I LOVE substituting Greek yogurt for sour cream; I wish everyone knew that simple food hack. yogurt is much more versatile. Great work! True story: I think sour cream is too runny. So I prefer the thickness of the Greek yogurt! My husband was complaining that we had no good snacks in the house last Sunday when I cam across the recipe on Pinterest. Luckily I had all of the ingredients on hand and he was SO pumped! Thank you!